Ever since the Telecommunications Act of 1996 was passed, the FCC has been required to periodically review the country's broadcast ownership rules. For those who may not know, the 1996 Act was responsible for widespread media consolidation: as ownership regs were loosened, companies like Clear Channel and Infinity Broadcasting were allowed to purchase many more stations across the country (and were also allowed to own more than two stations in a single market). Most recently, the FCC's 2006-07 review of the media ownership landscape has been met with unprecedented outcry; citizens are not happy about the homogenization of their airwaves, and are serving the feds with tons of public testimony and mounds of comments, urging them to steer clear of further ownership deregulation. Localism, dull/homogeneous programming, and concerns about the lack of station ownership by women and minorities appear to be at the crux the public's beef with broadcast radio and TV. These sentiments were reflected during the FCC's town hall meeting on media consolidation in NYC last year which I attended, and you can read the wrap-up on this post (as well as listen to the whole damned thing). It would seem as though the teeming masses who are upset with the current state of radio are simply asking for more community-based broadcasters. There is space reserved for community radio on the low end of the dial, but in many areas, religious conglomerates and NPR affiliates outbid local community groups for non-commercial, educational spectrum. So now, even non-commercial frequencies are sounding more and more alike across the U.S. No wonder the people are angry. How do we solve the larger, interrelated problems of media consolidation and crappy programming? How do we allow more voices to be heard on the non-commercial end of the dial, especially those who don't have the resources to purchase and manage a full-powered FM station? A loaded answer would be LPFM. The FCC re-established low-power radio licenses in 2000 as a response to an outraged citizenry, who were upset over massive media conglomeration just like they are today. Many believe that LPFM was not a real solution to the problem, as it relegates community radio to the teeny cracks of spectrum left over once the commercial giants and moneyed national non-profit groups had bought up all of the full-powered frequencies. Let the big guys broadcast at 50,000 W, and toss out 100 W scraps to community groups. Although these inequities certainly illuminate the secondary (or some might argue tertiary) status of local broadcasters, something is better than nothing. The fact that local groups were even given a space on the public dial was monumentous in itself. Today, the idea of establishing even more LPFM stations is gaining steam, with the Senate Commerce Committee voting to remove certain interference limitations for low-powered stations. The National Association of Broadcasters (NAB) is arguing (as they did in the late 90s) that LPFM stations will cause third-channel interference problems for their member stations (mostly large commercial broadcasters). Although a study debunking this theory was just released, NAB is claiming that these findings are flawed and will continue to lobby against LPFM and S.1675 (the Local Community Radio Act). LPFM cannot be expanded until the House and Senate vote for this bill. Prometheus Radio and Free Press are encouraging LPFM supporters to write to their representatives in support of S.1675. New Jersey residents in support of LPFM should pay special attention, as Senator Lautenberg has added an amendment to S.1675 that would essentially block any new LPFM licenses from being allowed in the Garden State. "Let the big guys broadcast at 50,000 W, and toss out 100 W scraps to community groups." While this sounds bad, it is actually pretty reasonable. How many community groups could feed a 50 kW rig? Even a 5 kW transmitter and antenna system can be a real handful, both in the engineering and financial sense. With the right people, a 100 W system can be purchased, run, and maintained on a tiny budget - the kind of budget that the community groups have. 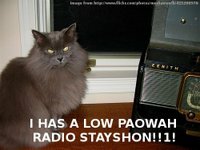 My radio show, "Future Quake" (www.futurequake.com), is broadcast on the low-power FM station WRFN, 98.9 FM in Pasquo, TN (www.radiofreenashville.org). In our 2-3 years on air, we have become a type of "flagship" of what LPFM can be as a thriving entity with exciting and diverse programming of community interest. Every Tuesday night, from 8 to 10 PM,, I interview big name guests like Alvin Toffler (author of "Future Shock"), Sheriff Joe Arpaio, Dr. Jerome Corsi, and many others, from our simple plywood studio out in the woods, with listeners around the world via the Internet as well (I will typically feature a song or two from WFMU "Beware of the Blog" during my "Music for Meditation" breaks on the half hour). Unfortunately, even downtown Nashville cannot hear us, since we were shoved out in the country, and our signal will only reach the Western edges of town. The radio experience has been life changing for me, and my listeners and guests (many of which will not be heard on "establishment" radio). Please support and expand LPFM! Thanks for keeping us apprised Liz. I send email to not be read by people! thanks for the great writeup, Liz.